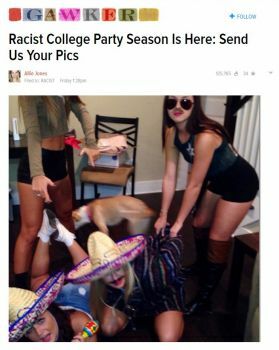 Texas Tech University is trying to get to the bottom of racist photos that allegedly show members of a sorority preparing for a “Border Patrol” party with two women posing as immigrants with sombreros and ponchos, the San Antonio Express-News reports. The photos depict two women dressed as police officers “arresting” the posing immigrants. The university is investigating Zeta Tau Alpha. The sorority’s national representatives insist only one Zeta Tau Alpha member was involved and denied there was a “Border Patrol” party. “We have already addressed the terribly insensitive decisions displayed in these photos with our member and apologize on her behalf for the offense she caused,” said Heather Kirk, director of education and communications for Zeta Tau Alpha’s national headquarters. Posted: 10/7/14 at 9:00 AM under News Story.